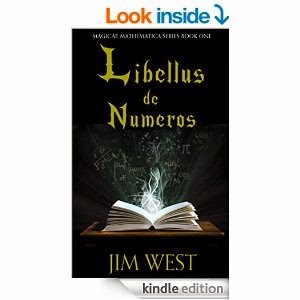 Libellus de Numeros (book 1 in the Magicae Mathematica series) is a book about a smart young girl who is transported to a mystical world. The protagonist, Alex, is independent and determined due in part to her busy parents’ absence in her life. When she’s teleported to an unfamiliar countryside, she sees none other than Archimedes on the road. Alex soon learns she is in a world where magic, wizards, math, and Latin play an important role in her life. One of the things I like about the world is it is approachable yet imaginative. For instance, the world's main city (The City) is protected by powerful, enigmatic Guardians, who are prepared for service by Archimedes. One of my favorite things about the book is that West does an excellent job of not letting a character be defined by a disability, such as the hearing-impaired character Maya. I also like the many layers of the plot. For example, there is a struggle between the classes in The City that adds an extra layer to the plot. This would be a great book for anyone (especially 8 - 15) who likes engaging stories with fantasy elements.